Games that are a part of the Zuma chain popper series. 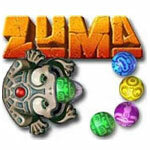 Zuma Deluxe (pc) - Stop the colored balls from advancing in ancient temples! 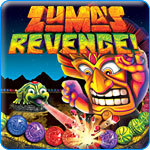 Zuma's Revenge (pc) - Enjoy new Zuma gameplay with boss battles and big power-ups!